In 1896 August Zinsser moved into his new home at Nos. 12-14 West 68th Street. The Queen Anne style mansion sat sideways, its northern end facing the street. A sprawling lot, more than 100 feet deep, fronted the entrance and provided sweeping views of Central Park. But two years later Zinsser sold his sybaritic front yard, retaining enough property to provide for a wide, shady courtyard. The Sun, on June 23, 1898 said that Zinsser had "made a very advantageous offer of the property, because he much preferred a church to an apartment house as a neighbor, and had set a special church bargain price on the plot." In doing so, he sparked a brief but vicious feud. The Church of Christ, Scientist was conceived by Mary Baker Eddy in 1866. Her novel approach to theology focused on the spiritual and deprecated the material. It quickly grew despite detractors who dubbed it a cult--mainly because of Eddy's conviction that illness should be healed through faith rather than man-made medicine. In 1888 Mrs. Augusta E. Stetson organized the First Church of Christ, Scientist in New York City. Its first minister, she was an ambitious and somewhat power-hungry figure. She was most likely less than enthusiastic when a high-ranking member, Mrs. Laura Lathrop, broke off in 1891 to form the Second Church of Christ, Scientist. 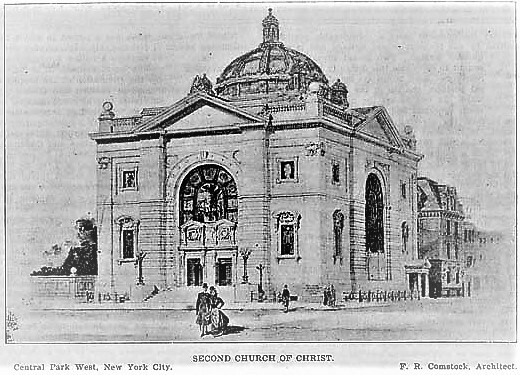 The Second Church of Christ, Scientist had about 500 members and was worshiping in the Scottish Rite Hall on Madison Avenue and 29th Street when it began shopping for a site for a permanent church. August Zinsser's plot seemed perfect, especially when, as reported by The Sun, they learned "that the First Church was about to build on Morningside Heights/" That site was far enough away to geographical competition and conflict. The Second Church signed an option of the 68th Street corner on May 13 and immediately began fund raising for the necessary $68,000. But Augusta Stetson seems determined to throw a wrench into Laura Lathrop's plans. The Sun, on June 23 1898, reported "Between the First and Second Churches of Christ, Scientist, of this city there has developed a certain lack of harmony." The day after the Second Church made its announcement, two men appeared at Zinsser's house and "said that if Mr. Zinser [sic] would break the option they would purchase the property without delay." The men, of course, represented the First Church, and they threatened "that if Mr. Zinser [sic] did not prefer their offer to that of the Second Church they would build within two blocks of his site." When the Second Church did not back down, the First Church raised the ante. It purchased the corner of Central Park West and 65th Street fro David H. McAlpin, just three blocks south, and announced it would build its new structure there. The battle of wills continued. On June 4, 1898 The New York Times announced that the Second Church had sealed the deal with Zinsser. The move prompted the Real Estate Record & Builders' Guide to comment "Central Park West has become a favorite location for churches." And when The Sun reported on June 23 that ground would be broken that day for construction of the Second Church building, it added "The next move of the First Church people is awaited with interest. If they persist in their intention to build at Sixty-sixth [sic] street there will be something very like competition between two bodies to which the mere thought of competition is constitutionally abhorrent." Eventually it was Augusta Stetson who blinked, purchasing a plot on Central Park West and 96th Street, a much less confrontational location nearly 30 blocks to the north. 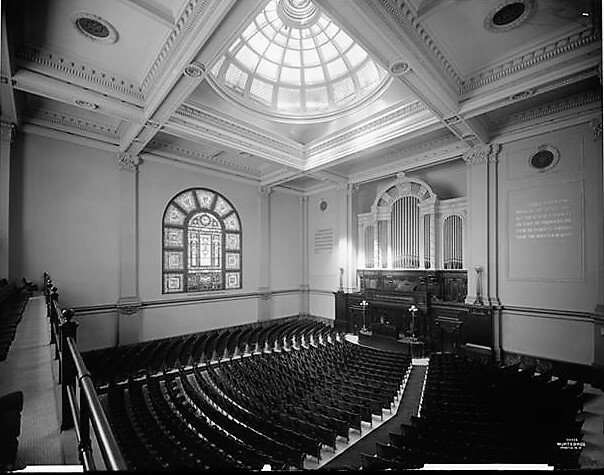 The Second Church of Christ, Scientist hired architect Frederick R. Comstock to design its building. His plans called for a "one-story marble church, to seat 1,000 people." The projected cost, $100,000, would be equivalent to nearly $2.9 million today. The construction site would become the scene of what was believed to be a miracle at the cornerstone laying ceremony on Easter Sunday, April 15, 1900. Laura Lathrop's son, John Carroll Lathrop, explained that stone masons working on the cornerstone had been told "that the legal title of the church, 'New York Second Church of Christ, Scientist,' should be engraved in raised letters on the block." The 10-ton granite block arrived on the site about three days before the ceremony. "About the same time," said Lathrop, "a letter arrived from Mrs. Eddy, in which she said she had noticed in the papers that the name the congregation had assumed was not logically correct, that it ought to be Second Church of Christ, Scientist, of New York City.'" In a panic, trustees contacted the contractors, who said, of course, that the changed could not possibly be made in time. "Almost in despair, we broke the box open when, lo! the inscription which met our astonished eyes was just the one declared the correct one by our beloved leader. The contractor insisted that his orders had been in accord with our instructions and he looks upon the incident to-day as a miracle." The church was completed in the spring of 1901 and in his remarks during the dedication ceremony on April 7, Lathrop reiterated the story of the cornerstone miracle. It was passed on to astonished readers by newspapers city-wide. The New-York Tribune noted the story "attracted wide-spread attention, particularly in religious circles." That wide-spread attention prompted further investigation and two days later the church was forced to make the uncomfortable admission that "No miracle was wrought, nor do we say that any marvelous change occurred." While, indeed, the contractor had followed his instructions, but what the trustees did not know was that when the name of the church was changed earlier, the revision was passed on to the contractor. Comstock's chaste marble and granite structure successfully avoided churchy architecture which would have suggested well-established religions--Jewish, Roman Catholic or Protestant. Instead it drew from several historic styles and presented a stately presence with the front and side elevations being near matches. The vast stained glass window on the 68th Street side was mimicked on Central Park West where it sat imperially above the paired entrances. The nearly-square edifice was crowned by a striking copper-clad dome. John Carroll Lathrop would be back in the newspapers a year later. He had first studied healing with his mother, and then attended Mary Baker Eddy's class in 1898. He was called to the home of Mr. and Mrs. John Quimby when their seven-year old daughter Esther was seriously ill with diphtheria. Lathrop used his training of faith and prayer in his attempts to cure the little girl. But she died on October 19, 1902. The Coroner was brutally frank in his report, which said her death was the result of the "culpable negligence of her parents John Quimby and Georgianna Quimby also a certain so-called 'healer' named John Carroll Lathrop, in failing to provide proper medical care and attendance." All three were charged with manslaughter by neglect. Outside the courtroom on October 23 Laura Lathrop said the publicity of the case "gives us a chance to tell our belief and that sets people to thinking. Once the people get to thinking they buy our books and the result is that they are converted to Christian science." The Church rallied around him and promised to pay for his defense. 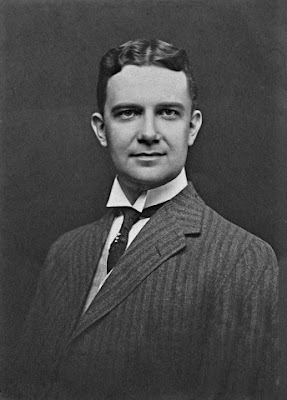 John L Roberts told reporters "The charge of manslaughter cannot be maintained because no material act was performed which could result in manslaughter according to the legal definition of that term. The Lord will provide funds for Mr. Lathrop's defense and Christ Science will benefit by the notoriety given our Church." Joining those who reviled the Church of Christ, Science, was The New York Times, which unapologetically admitted so in replying to a letter to the editor on November 24, 1903. That letter complained that an article regarding Mrs. W. D. Baldwin was inaccurate. The newspaper's rebuttal included "It is hardly necessary--and, if necessary, quite useless--for us to assure Mrs. Baldwin that our detestation of Christian Science, deep as it is, would never lead us into intentional misstatement." The total cost of the Second Church of Christ, Scientist's land and building seems to have surpassed the $168,000 originally published. When Mary Baker Eddy died in 1910, she left the church $175,000 "to pay indebtedness which may exist at the time of my decease upon the church edifice." To make sure she had not over estimated that debt, her will directed that if the amount needed was less than the $175,000, the bequest would be limited to the lower figure. In 1917 the growing membership necessitated an enlarged sanctuary. In July the esteemed architect Grosvenor Atterbury was hired to make alterations His plans consisted of "redecorating the interior of the church and making partition changes to increase seating capacity." The officials of the church may have raised religious eyebrows in 1920 when they met on March 13 and resolved to boycott the Christian Science Monitor. Insisting that it and other periodicals and pamphlets were "not published in accordance with the mother church manual," they deemed them "spurious and unauthorized." Seven decades after dedicating its marble church, the congregation considered selling it to developers "who would replace the imposing structure with an apartment tower and a smaller chapel," as reported by Leslie Maitland in The New York Times on May 13, 1982. Faced with a dwindling membership and resultant financial pressures, the church had been debating the issue for about four years. The prospect sparked a neighborhood group to push the Landmarks Preservation Commission to designate the structure an individual landmark. The Church pushed back by opposing designation. Its attorney Douglas W. Hawes claimed that "preventing a church body from exercising its freedom to handle church business in the way it sees fit violates the First Amendment to the Constitution." Arlene Simon, chairman of the local committee, responded "The destruction of this church would be a terrible, terrible loss to the community." Also not immune to smaller membership and reduced finances was the First Church of Christ, Scientist. The salvation of the Second Church structure came through an ironic joining of forces. The two congregations, once bitter rivals, merged in 2003. Second Church retained its building and the First Church kept its name. The magnificent First Church building was saved at the eleventh hour by locals, spearheaded by LandmarkWest!, from being converted to apartments. In 2018 the Children's Museum of Manhattan purchased the structure for its new home.